This histology stain can be used to stain pancreatic islet beta cell granules. This stains elastic fibers purple/black. This histology stain will stain mucins and mucosubstances blue. Copper in the histology stain is what ultimately is responsible for the blue color. Nuclei will stain pink/red. Cytoplasm stains a lighter pink. Mucins stain blue. This histology stain is an anthraquinone derivative. This histology stain can be may be used to identify calcium in tissue sections. This histology stain will stain endothelial cells. Sites of alkaline phophatase activity will appear red. Nuclei will stain blue. Silver is used in this histology staining process. This histology stain shows reticular fibers. 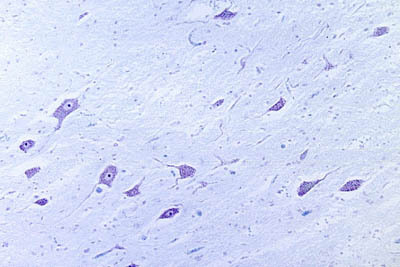 This histology stain is also used for showing neurofibrillary tangles and senile plaques. Neurofibrillary tangles and senile plaques will stain black. This histology stain is used on nervous tissue. Congo red histology stain is used to stain amyloid. Amyloid will stain orange/red. This histology stain is a Nissl stain. Cresyl violet will stain both neurons and glia. It bonds well with acidic parts of cells such as ribosomes, nuclei and nucleoli. It stains cell bodies a blue/violet. This histology stain uses silver. Fontana-Masson stains argentaffin granules and melanin black. The nucleus will stain pink/red. The cytoplasm will stain light pink. This is a histology stain for peripheral blood smears and bone marrow. It is also used to visualize parasites and malaria. This is a Romanowski type stain. Methylene blue and eosin are used. Erythrocytes stain pink/red. Platelets and leukocytes stain blue. This micrograph depicts the appearance of a well-stained slide using the Giemsa staining technique. This histology stain will stain neurons. A trichrome histology stain is a mixture of three dyes. Gomori's trichrome will stain connective tissue and collagen green or blue. It stains muscle, keratin and cytoplasm red. Nuclei will stain gray/blue/black. This is a standard histology stain. "H&E" stand for hematoxylin and eosin. Hematoxylin and eosin stain is used for routine tissue preparation frequently. This is the most often used combination in the histology lab for general purpose staining. Hematoxylin can be thought of as a basic dye. It binds to acidic structures, staining them blue to purple. It will bind and stain nucleic acids. Therefore, the nucleus stains blue. Eosin is an acid aniline dye. It will bind to and stain basic structures (or negatively charged structures), such as cationic amino groups on proteins. It stains them pink. Cytoplasm, muscle, connective tissue, colloid, red blood cells and decalcified bone matrix all stain pink to pink/orange/red with eosin. With an H&E stain, mucus and cartilage will stain a light blue color. This histology stain will stain nuclei bluish/black. This histology stain can be used to demonstrate elastin and mast cells. Elastin fibers and mast cells will stain purple. Nuclei will stain black. This histology stain is the alcohol soluble equivalent of alician blue. Luxol fast blue is used to demonstrate myelin. It stains myelin blue to blue/green. Neurons stain violet. Red blood cells stain blue. A trichrome histology stain is a mixture of three dyes. 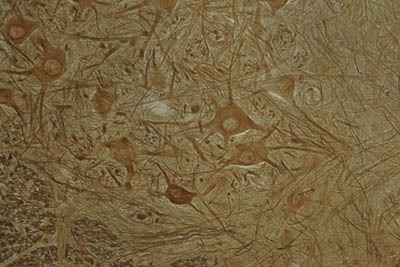 This histology stain is used on connective tissue to visualize collagen and reticular fibers. A trichrome histology stain is a mixture of three dyes. This histology stain can be helpful for differentiating cellular from extracellular items. This histology stain uses light green, iron hematoxylin, and acid fuchsin. It is useful on connective tissue. Collagen fibers stain green or blue with Masson's trichrome stain. Muscle and keratin will be red. Cytoplasm will be pink to red. Nuclei will be black. This histology stain is used to visualize connective tissue. Mucicarmine is a histology stain used to see epithelial mucin. It stains it a deep red. These histology stains are basic dyes. They stain RNA and DNA. It is used to see Nissl body in neurons. Nissl bodies stain purple/blue. This histology stains nuclei red. The cytoplasm will be unstained or yellow. This histology slide of the liver tissue stained postive for calcium deposits (stained black) with Von Kossa and the background is stained with nuclear fast red. This is a histology stain used for lipids. Lipids will stain red. Nuclei will stain blue/black. A histology stain used for elastin fibers. This histology stain can be used to stain lipids. Collagen and erythrocytes will stain brown. Myelin and lipids will stain black. 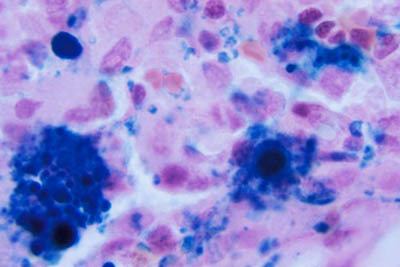 This histology stain is used mainly on exfoliated cytological specimens. 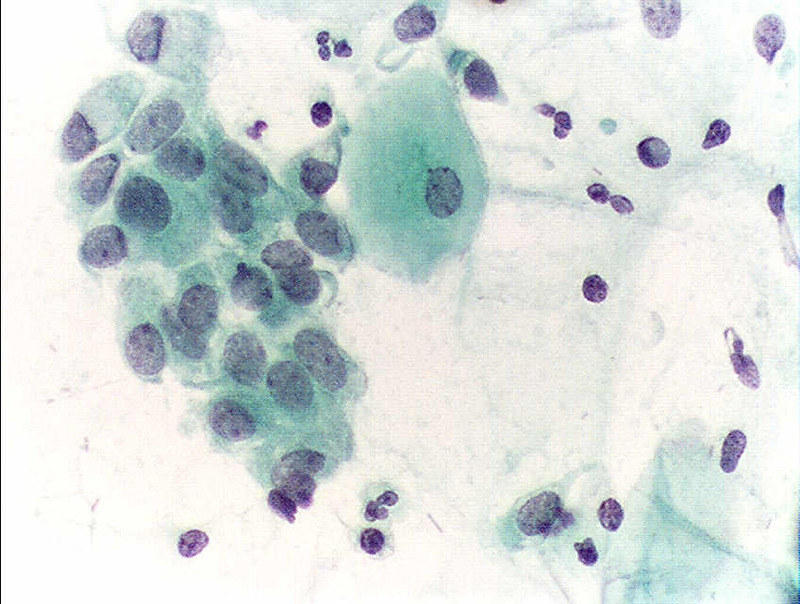 Cells in smear preparations can be stained with Pap staining. Gynecological smears (Pap smears), sputum, urine, cerebrospinal fluid, abdominal fluid, pleural fluid, synovial fluid, semminal fluid and fine needle aspiration samples can all be stained with a Pap stain. This staining technique involving five dyes in three solutions. This histology stain is particularly useful for staining glycogen and other carbohydrates, but is useful for many things. It is often used to show glomeruli, basement membranes, and glycogen in the liver. PAS stains glycogen, mucin, mucoprotein, and glycoproteins magenta. The nuclei will stain blue. Collagen will stain pink. This histology stain is used to stain striated muscle fibers and mitochondria. They will stain blue. Nucleus, red blood cells and muscle all will stain blue. Collagen will stain red. In this histology slide of the tongue, PTAH stains the collagen pink, fibrin blue, and striated muscle blue as well. When used with polarized light, this is a way to visualize collagen. With polarized microscopy, collagen fibers will be bright yellow or orange and the thinner fibers will be green. Prussian blue histology stain is used to stain iron (ferric iron and ferritin). This histology stain uses silver salt. Reticular fibers become black. Sometimes a counterstain is used. These histology stains are used for blood and bone marrow. Examples of Romanowsky histology stains include Wright's stain, Giemsa stain and Jenner's stain. These histology stains are based on a combination of eosin and methylene blue. This histology stain will stain mucin, cartilage and mast cells. It stains them orange/red. Safranin O is sometimes used as a counterstain. These histology stains use silver. Argyrphilic tissue has an affinity for silver salts. The silver salts will be seen in argyrphilic tissues. Silver histology stains are used to show melanin and retiuclar fibers. Reticular fibers will stain black. Sudan histology stains are used for staining of lipids and phospholipids. Examples of such histology stains are sudan black, sudan IV, and oil red O. This histology stain will stain cytoplasm, cartilage, and red blood cells yellow. This knee joint is stained to show the growth plate in purple. This histology stain is sometimes used in conjunction with iron hematoxylin. 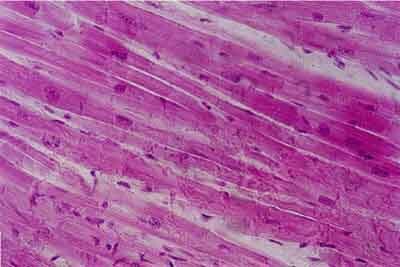 This histology stain can be used to differentiate collagen and smooth muscle. Cytoplasm and muscle stains brown/yellow. Collagen stains red. Red blood cells stain yellow. Cartilage stains pink. A histology stain used for connective tissue and particularly to see elastic fibers. Sometimes a counter stain is used. This histology stain is can be useful when looking at lung tissue and arteries. Elastin will stain a dark brown/black. The nucleus of cells stains black. This histology stain is a silver reduction method used to visualize calcium and calcium deposits. Here the chondrocytes in the growth plate are staining black. This histology stain is used for blood smears and bone marrow smears. This histology stain uses a blend of basic dyes, such as methylene blue derivatives and acid dyes, such as eosin. Red blood cells stain reddish/pink. Eosinophilic granules will be a bright orange/red. The nucleus of white blood cells will stain purple. Basophilic granules will stain blue/black. Neutrophilic granules stain pale brown. Platelets stain purple. The cytoplasm of lymphocytes stains pale blue. This histology slide has been stained using an "automatic staining" device. It is a Wright's stain. The acidic components, such as the nucleic acids, will take on the basic portion of the stain, or the methylene azure color, and stain blue. The basic components, such as erythrocyte hemoglobin, will stain pink with eosin, since eoisn is an acidic dye.